The 7 Elements of Wisdom! IAmElemental action figures represent the 7 Elements of Wisdom - Creativity, Ingenuity, Curiosity, Logic, Exploration, Mastery, and Oblivion. 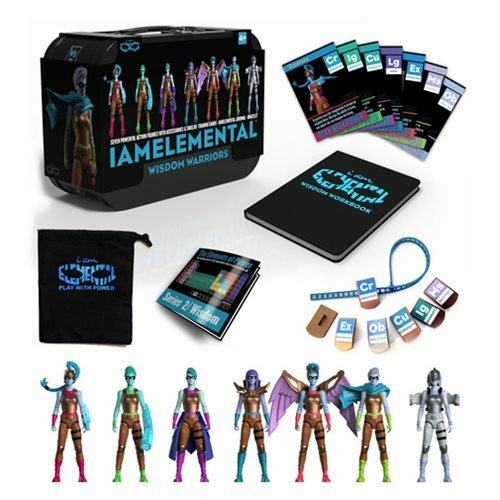 The IAmElemental Series 2 Wisdom Action Figures and Carrying Case includes the 7 Elements of Wisdom action figures, 1 interactive IAmElemental Wisdom workbook, 1 drawstring carry bag, and 1 adjustable bracelet. Each of the 4-inch articulated action figures include a shield and interchangeable accessories. Wear your Elemental Shields on the adjustable bracelet. Wear one, or wear them all. You choose. Ages 4 and up.